With the Greek bailout, the refugee crisis, and Brexit all fresh in mind, 2017 was set to become a crucial election year in which populist parties, riding on a wave of discontent, could destroy the EU. In the Netherlands, the firebrand anti-immigration politician Geert Wilders did not blow the establishment away as polls had predicted. In France, far right presidential candidate Marine Le Pen did not change Europe’s future. And in Germany, Chancellor Angela Merkel is leading the polls, with a damaged Martin Schulz behind her, and the anti-EU-party Alternative fur Deutschland more than 20 points behind Schulz . The Macron victory could be a turning point after the shocks of Trump’s election and the Brexit vote. European Commission President Jean-Claude Juncker called it a “ signal of hope for Europe ”. By meeting Merkel in his first state visit, President Emmanuel Macron embodied that hope: that the powerful German-French twin engine could roar once again. Merkel and Macron gave some indications of how this could happen. It would begin with France launching domestic reforms that would make the French economy more resilient. This could lead to a German willingness to relax its tough line on Eurozone fiscal management. And neither leader is excluding the possibility of treaty reform. Of course, all of this can only start after the German federal elections in September. So, could it be that the winter of our European discontent could now turn into a glorious summer? Could it be that the politicians who want to build bridges are fully in charge again, with those wanting to build walls watching grudgingly from the sidelines? Even the founding countries of the European project demonstrate that Euroscepticism is not dead and buried yet. First of all, it remains to be seen what kind of leader Emmanuel Macron will be. He presides over a country where 16 million registered voters did not show up in the second round of the elections, or gave a blank or spoiled vote . His electoral victory was a welcome win for the European project, but at the same it was an historic anti-establishment ballot. This may very well result in a hostile parliament, which could turn the new president into a proverbial lame duck, even as early as next month, when France elects a new assemblée . The same goes for the Netherlands, one of the other founding countries of the EU. Wilders certainly showed more promise in the polls than was realized on election day, but that doesn’t mean Dutch politics are now straight-forward. Government coalition talks collapsed on 15 May due to a split over immigration policy. 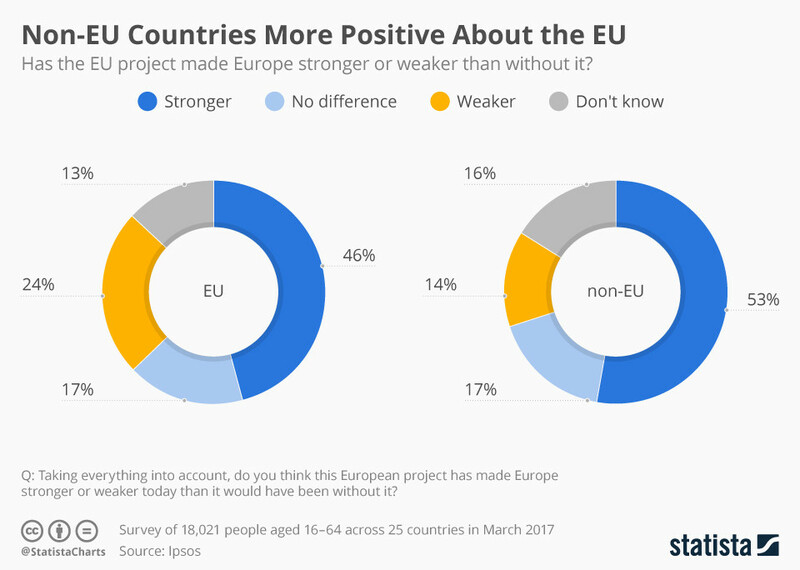 This shows that the critical political divide in Europe – between an open, international society, and an isolated one – is still there. In Italy, only 53% of people support the euro, which is seen by many as causing the country’s economic woes. This is new for Italy, where support for the euro stood at 73% in 1992. Three of the country’s four major parties are tapping into Eurosceptic sentiment, with the populist Five Star Movement polling around 30%, and now neck and neck with the Social Democrats. These are the two contenders vying to become the largest political party after the next election. This is the core of Europe. Even Belgians, over the last 10 years, have lost a great deal of their once unconditional love for the EU and are increasingly worried about the “social dumping” of East-European workers in their country. All this culminates in the UK leaving the EU, Poland defying the rule of law, Hungary refusing to accept EU migration policy and Greece still struggling after more than seven years of bailouts. So, yes, those who wanted to build walls in France and the Netherlands were blocked from power. But no, Euroscepticism is not dead and buried. This is bigger than Greece, or Hungary, or the UK. Even the historic heart of Europe demonstrates that, although there is new hope for Europe, the fight is far from over. The key to solving this problem was hinted at by the first President of the European Council, Herman Van Rompuy, when he received the Charlemagne Prize in Aachen, in May 2014. “With Europe, the focus has always been on space,” he said. “From the very start, the typical action was to remove borders, for goods, workers, investment, to let people and companies move, take initiatives, seize opportunities. “Even today – in fields as diverse as energy, telecoms or the digital economy – it is still about bringing down borders, creating this big common space. This is the way to go, but it’s a difficult way. It means Europe must protect both the unemployed and those who fear terror. This is difficult, as social and security policies are national, not European affairs. No government in the EU is willing to give up command of its army and police, or to scale its social security up to a European-wide level. The Macron era may be one of hope, where results can lead to trust and then to more results; but it will be no walk in the park. We might be seeing the first signs of an early spring, but the glorious summer is still far off.